The distorted galaxy in the simulation results from a collision between two galaxies, followed by them merging. Astronomers think such a merger could be the reason why SPT0346-52 is having such a boom of stellar construction. Once the two galaxies collide, gas near the center of the merged galaxy (shown as the bright region in the center of the simulation) is compressed, producing a burst of new stars. The composite inset shows X-ray data from Chandra (blue), short wavelength infrared data from Hubble (green), infrared light from Spitzer (red) at longer wavelengths, and infrared data from ALMA (magenta) at even longer wavelengths. (The light from SPT0346-52 is distorted and magnified by the gravity of an intervening galaxy, producing three elongated images in the ALMA data located near the center of the image. SPT0346-52 is not visible in the Hubble or Spitzer data, but the intervening galaxy causing the gravitational lensing is detected.) 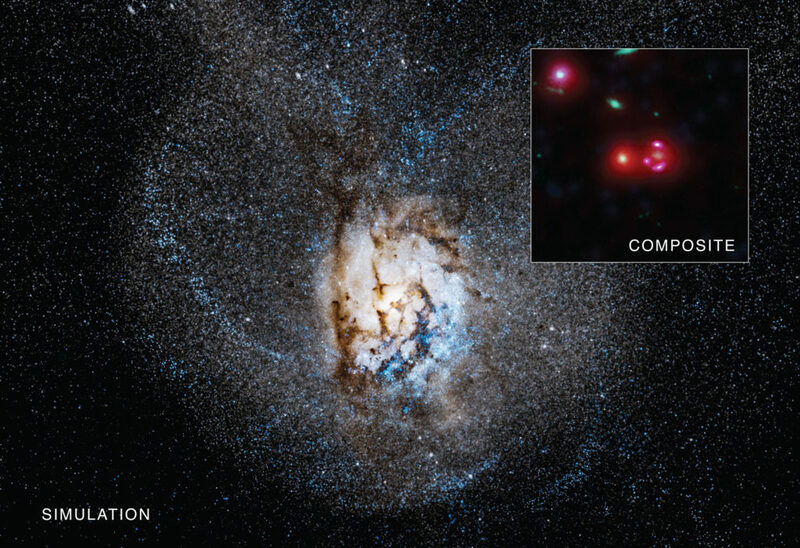 There is no blue at the center of the image, showing that Chandra did not detect any X-rays that could have signaled the presence of a growing black hole. Image Credit: CXC Press Office. December 10, 2016 – A recently discovered galaxy is undergoing an extraordinary boom of stellar construction, revealed by a group of astronomers led by University of Florida graduate student Jingzhe Ma using NASA’s Chandra X-Ray Observatory. The galaxy known as SPT 0346‐52 is 12.7 billion light years from Earth, seen at a critical stage in the evolution of galaxies about a billion years after the Big Bang.